Although the 116 pages of translation lost by Martin Harris in 1828 contained writings from the book of Lehi, not all of Lehi's words are lost to us. 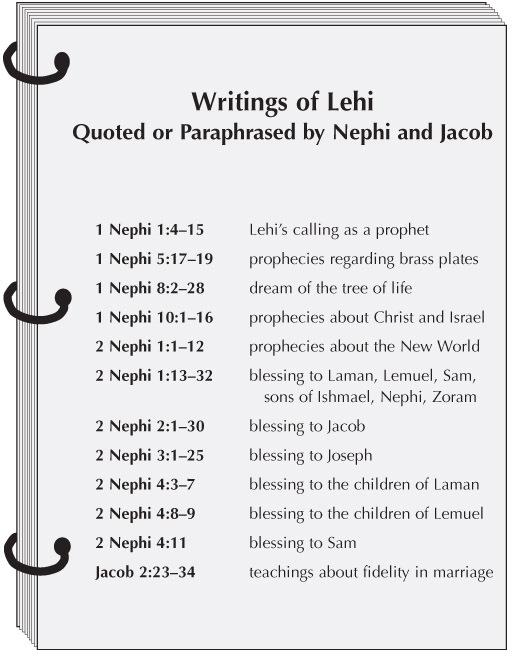 Lehi's prophecies, visions, and teachings were often quoted or paraphrased by his sons Nephi and Jacob in their own writing and preaching. S. Kent Brown, professor of ancient scripture at Brigham Young University, suggests that this is evidence that Nephi and Jacob used the personal record of Lehi as a primary source in writing about the new land of promise, Jesus Christ, Israel, marriage, and other important topics. This chart indicates where in the small plates of Nephi the words of Lehi, originally written from about 600 to 570 B.C., are found today.